The sepia photograph (above) was taken a few years after the previous image and there are now nets surrounding the grass tennis courts. The two women who are on the courts nearest the camera and holding tennis racquets do not appear to have partners. There are more tennis courts on the far side of the band stand and all the players using them seem to be women. A bowls match, an all male affair, was taking place on the green behind the nearer set of courts; the bowling green on the far side of the band stand had clearly not been laid at the time. However, it is marked in its current position on the OS map of 1922, so it was set out not long after the picture for this card was taken. In 1930 the bowling club members' activities were likened to Monte Carlo when a Councillor reported complaints of gambling at bowls matches to a Council Meeting! Shillings and half crowns were said to being bet - but the Council preferred to take no action. The enlargement below shows the far end of the park, with the shops and houses of Matlock Green on the left and a wall running along the boundary of the properties in Knowleston Place. The two figures in white are also playing tennis. Having taken the photograph at the top of the page, the cameraman strolled just a few yards to the other side of the band stand to take his next park scene. The post cards have consecutive numbers and were both registered by Valentine's in 1914. A group of people are playing croquet in the picture below, a game that was very popular in the Matlocks before the first war and which continued to be played on the Hall Leys between the wars. The hoops were laid out on an area of grass that was later to become the bowling green. There are also tennis nets closer to the pavilion building, although they only go part of the way around the area where the two women can be seen holding racquets. The women (or girls) are facing the camera, so not exactly concentrating on their game! 1. 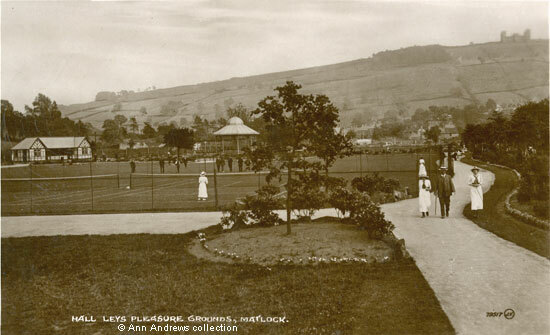 "Hall Leys Pleasure Grounds, Matlock". Valentine's X L Series, No.79517, Real Photo cards. Not posted. Valentine's produced a black and white as well as a coloured version of this card. Postcard in the collection of, provided and © Ann Andrews. 2. 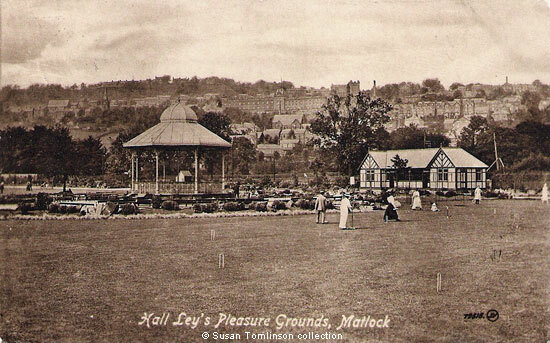 "Hall Leys Pleasure Grounds, Matlock". Valentine's X L Series, No.79518, Real Photo cards. Posted 22 Nov 1926. It was from someone in the Smedley Memorial Hospital and was sent to Stanton in Peak. Postcard in the collection of, provided and © Susan Tomlinson.